Parkway, and can be reached by both of these scenic roads. 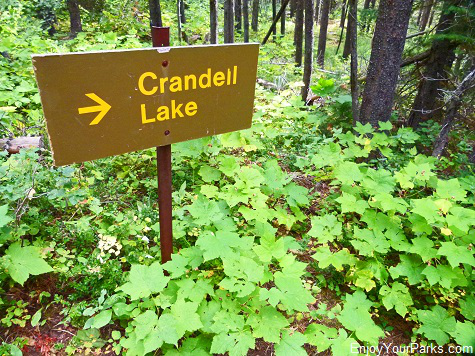 Both directions are relatively short and easy hikes, therefore the hike to Crandell Lake is a great family activity. 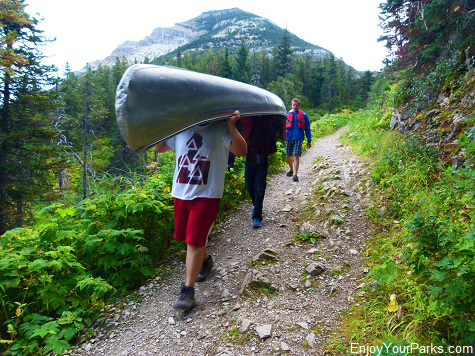 The hike to Crandell Lake in Waterton Lakes National Park is quite pleasant and scenic. 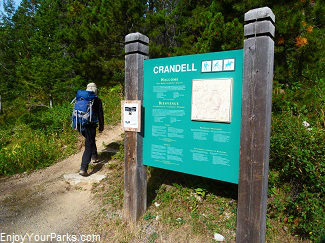 Along the Akamina Parkway, the trailhead to Crandell Lake is about 5.6 miles into the parkway. There is a large trailhead sign to the right, and you can't miss it. If you see the Discovery Well Historic Site, you've gone too far. The trailhead along the Red Rock Parkway is found just beyond the Crandell Mountain Campground. To get there, take the obvious Crandell Mountain Campground Road off the Red Rock Parkway, and stay left once you cross the large bridge. This road wraps around the campground to the south, and takes you directly to the Crandell Lake Trailhead. Crandell Lake is quite nice, especially early in the morning or late evening when the water is glass and the reflections of the surrounding mountains make for a really nice scene. 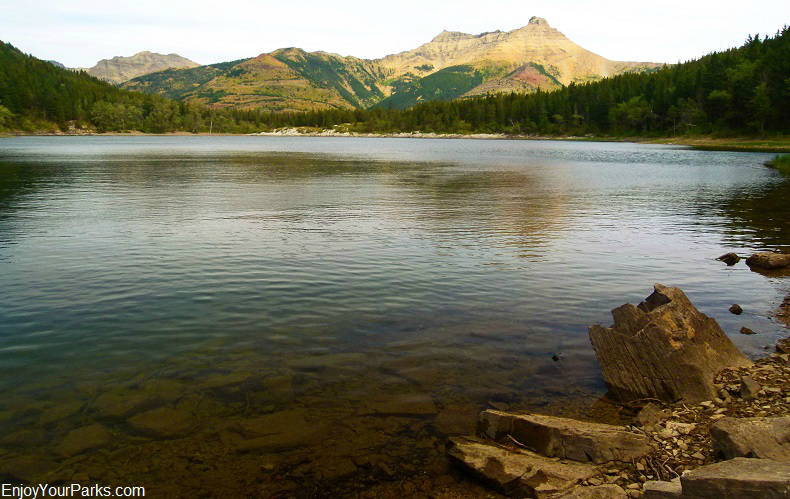 The jagged Mount Galway can be seen to the north, which helps improve the overall beauty of this Waterton Lakes National Park lake. 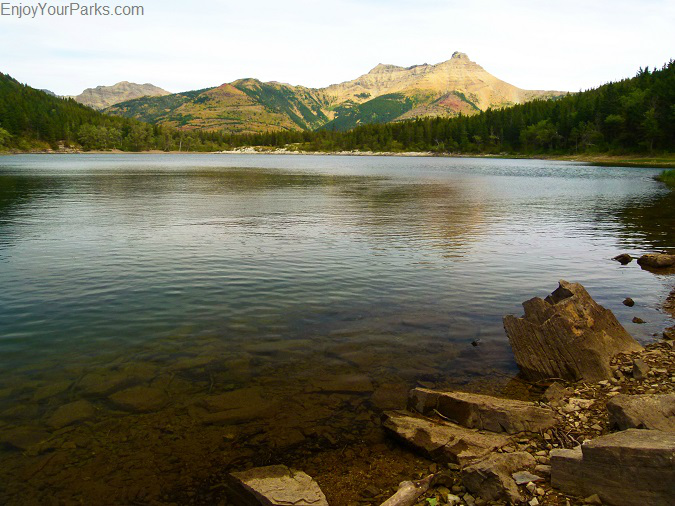 Crandell Lake in Waterton Lakes National Park. There is also a backcountry campground located at Crandell Lake that allows hikers to spend the night in this scenic area. 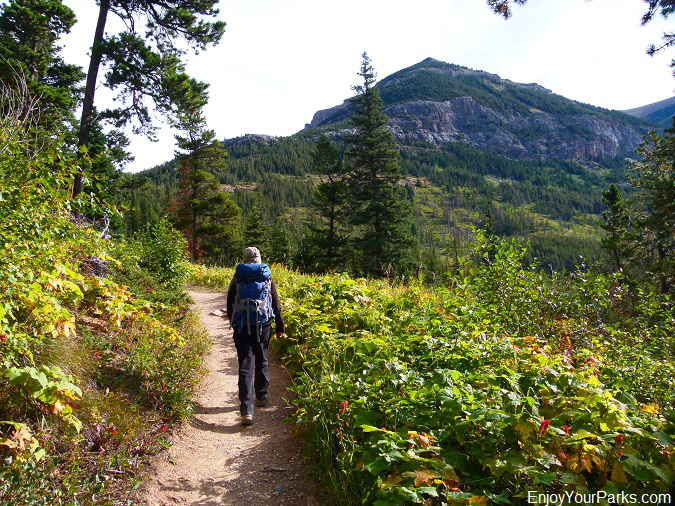 Of course reservations are required, as well as a backcountry permit that you can get at the Waterton Lakes National Park Visitor Center just outside of the Waterton Townsite. 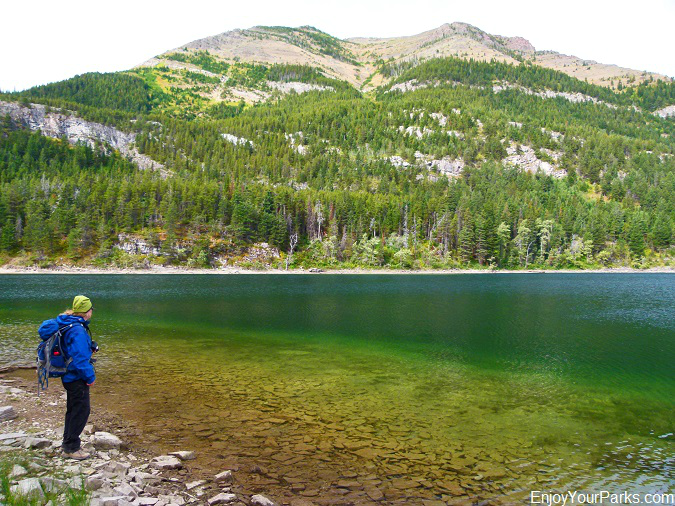 Crandell Lake is known for good trout fishing, so you might want to bring your fishing pole along. As we were hiking back to our vehicle that was parked at the trailhead along the Akamina Parkway, we passed these avid fishermen (see photo to the right) who were carrying their canoe all the way to Crandell Lake... now that's what we call commitment! 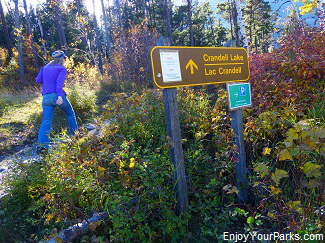 As we've stated earlier, the hike to Crandell Lake is great for families because it's not a very long hike, and is relatively easy. By far the easiest hike is from the Akamina Parkway trailhead because it's half the distance and half the vertical elevation gain as the hike from the Crandell Mountain Campground on the Red Rock Parkway. 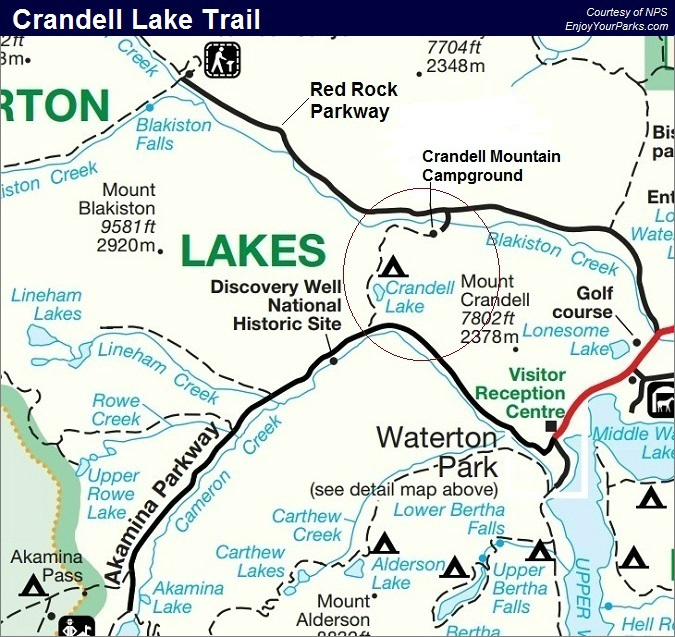 All in all, the Crandell Lake Trail is definitely among the easier Waterton Lakes National Park hikes that is quite enjoyable, especially if you're looking for a short day hike that doesn't take a lot of time.